As you've probably noticed, we're deep into August and slowly sinking into the gross, humid swamp of late summer. You're probably feeling a little lethargic, and that's understandable. If there's anything that cures lethargy, though, it's free things and coffee, and we're pleased to inform you that you will be getting free coffee on Thursday. Which means you're late-summer slump is ending! At least for a day! 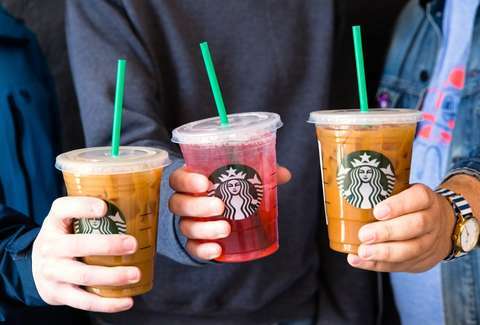 So here's the deal: On Thursday, August 16, Starbucks is offering buy one get one free (BOGO) on iced beverages, size grande or larger. That includes iced espresso drinks, cold brew, Starbucks Refreshers, iced tea, and iced coffee. And they don't have to be the same drink, so if you're a tea person and your work buddy is a cold brew fan, no problem. Speaking of Refreshers, Starbucks just added a new flavor to its lineup of popular non-coffee drinks this summer, the Mango Dragonfruit Starbucks Refresher, or "Dragon Drink." Like the Insta-famous "Pink Drink" that came before it, the shaken beverage features a stunning magenta hue that's worthy of at least 30-something likes. The coffee chain said it's made with pieces of actual red-fleshed dragon fruit (also known as pitaya), making it downright "bursting with sweet, tropical flavors." You may even want to tone it down a bit by customizing it with coconut milk instead of water. Thursday's promotion is part of Starbucks' ongoing Happy Hour promotion so you can't just show up and demand enough cold brew to make your hands shake. To participate, you have to sign up for Starbucks Rewards and show the promo code for the Happy Hour to the barista when you order. And keep in mind that this deal is only good from 3pm onward, so this won't be your morning pick-me-up. But you're also getting double the caffeine, so your afternoon's going to feel like a second morning.